A fire in a derelict leisure centre that saw about 100 people evacuated from their homes is being treated as suspicious, Kent Police have said. Plumes of black smoke could be seen rising from the blaze, which started in Nelson Road, Northfleet, at about 18:40 BST on Tuesday. Two people had respiratory issues, with one taken to hospital, police said. Displaced residents were allowed home at about 23:00 BST after the fire had been put out. 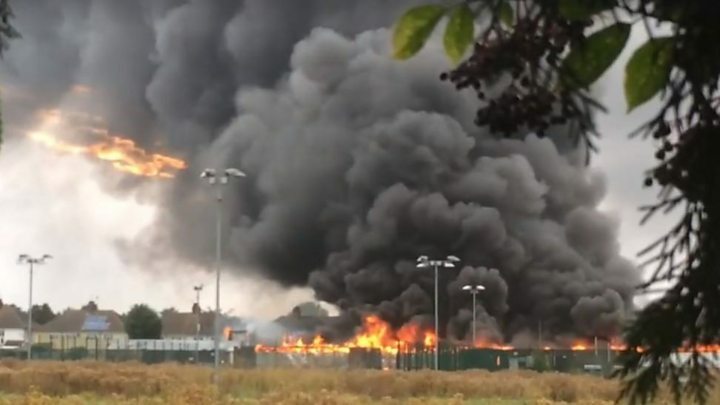 Kent Police is investigating the blaze alongside fire investigators and urged anyone with information to contact the force.